For frequent travellers to Jakarta, be it for business or shopping, Garuda Indonesia promises a greater level of comfort and flying experience through the introduction of their newest fleet Boeing 737-800 Next Generation. Besides new planes, travellers with Garuda will also be introduced to their new service approach “Garuda Indonesia Experience” which presents the uniquely Indonesian style of service from the traditional warm greeting to the signature Indonesian food and beverage served onboard. The best thing about Garuda flights (that beats other budget/full-fare airlines on the same route) from Singapore to Jakarta is that Garuda operates up to 7 such flights daily, starting from Singapore as early as 7.30am and latest flight from Jakarta is as late as 8.35pm (reaching Singapore at 11.10pm) – perfect for both business (morning meeting in Jakarta, late afternoon meeting back in Singapore) or pleasure (a weekend getaway to Jakarta). We had the opportunity to experience the latter, thanks to Garuda Indonesia and Icon Communications, through a 3 day 2 night weekend getaway to Jakarta and Bandung. 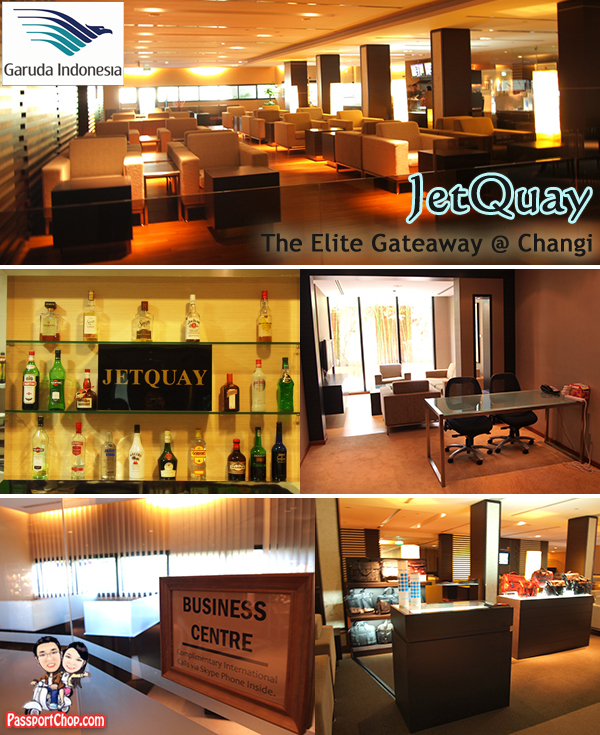 If you are an Executive Class passenger, you can also enjoy the VIP Check-in services at JetQuay, a luxury Commercially Important People (CIP) Terminal – a huge facility with a whole suite of amenities to cater to any needs of a traveller. Once you arrive at JetQuay, you will be greeted by a JetQuay staff who will be your personal concierge until you get on your flight. She will handle your check-in, immigration and baggage clearance while you sit back and relax in the lounge. You don’t even have to fuss about chalking up huge parking fees at the airport as parking is free at JetQuay for the duration of your trip! 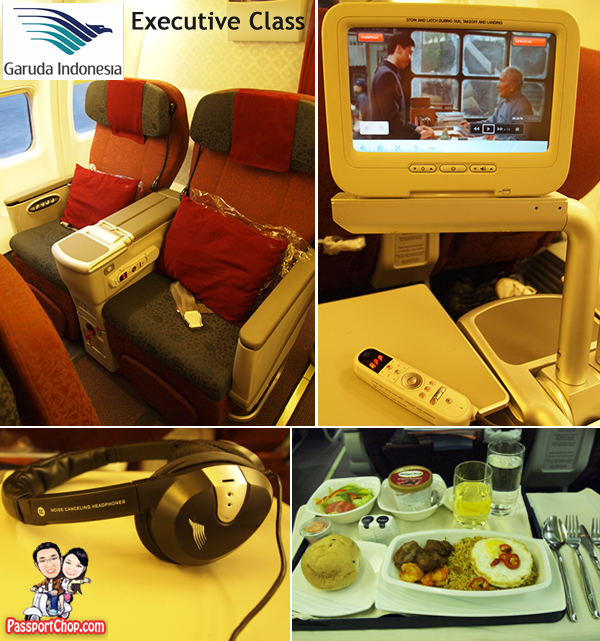 Perfect for a weekend getaway or a business trip to Jakarta/Bali with Garuda Indonesia Executive Class. If you are hungry, head for the sandwich bar which stocks light snacks and finger food e.g. biscuits, sandwich, cereals, cakes; you can also make you own coffee with the espresso machine or request for a hot chocolate from the staff. 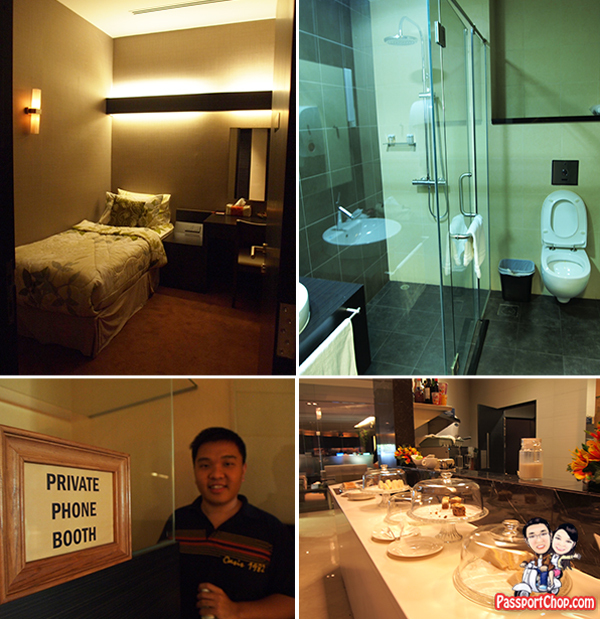 If you have just arrived in Singapore from a long flight, you can freshen up using at the shower facilities which provide disposable amenities such as shampoo, shaver, comb or just take a nap at one of the four nap rooms available in JetQuay (on a first come first served basis – advanced reservations recommended). Have you seen people zipping around comfortably on a buggy while you trudgingly push your luggage trolley around and thinking why are those people so lucky? – well that’s the JetQuay service. The coolest thing about this JetQuay service for Garuda Executive Class passengers is the buggy ride from the CIP terminal right to your gate of departure just minutes before the flight is due to depart. Singapore Changi Airport is quite big and some departure gates are very far off – with this service, you save yourself some walking and if you need to do some quick duty-free shopping, inform the JetQuay staff early and they can arrange to drop you off at the shop or even pick up your shopping items for you while you rest in the lounge. 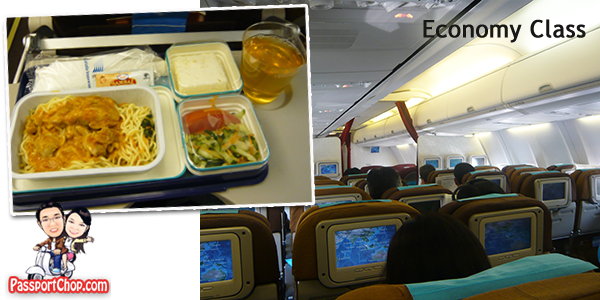 We got to experience this too – thanks to Garuda Indonesia. 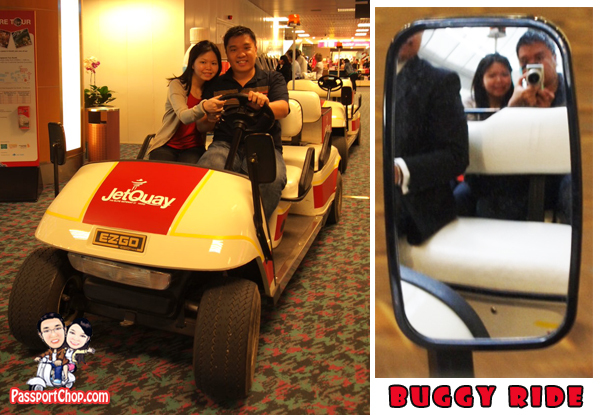 Just a word of warning, although the speed of the buggy is capped at 10km/hr – it can get quite cold during the ride around parts of the terminal which are less crowded. For flights from Singapore to Jakarta on the new Boeing 737-800 plane, the Garuda Indonesia Executive Class seats boats a generous 42 inch seat pitch and comes with a range of business traveller-friendly amenities e.g. personal reading light, retractable 9 inch touch screen LCD monitors and even noise-cancelling headphones! The Garuda Indonesia Airlines’ stewardess’ service is what stood out during my Executive Class experience – they are always eager to serve and meticulous in their service, ensuring everything is in order during meal service and that you are comfortable during the flight. The food is excellent too – Indonesian fried rice with Haagen Daaz ice-cream for dessert and a glass of Chardonnay white wine to round up an sumptuous dinner. What’s common between the Economy and Executive Class is the Audio & Video on Demand (AVOD) system – a state of the art inflight entertainment system which provides a choice of 35 feature films, 10 TV programs, 48 music albums and 25 interactive video games – more than enough to keep you occupied during the short 1.5-hour flight to Jakarta. The best part about the AVOD system is its touch screen LCD monitors – no more fumbling around with the controller. Garuda Indonesia offers a decent 32 inch seat pitch with ergonomically designed seats, ensuring a comfortable ride for all passengers. You can also look forward to a hot meal of spaghetti or Indonesian fare even for this short flight – a luxury that not all full-fare airlines provide; indeed a very welcomed gesture especially after a long day of fun or work in Jakarta. 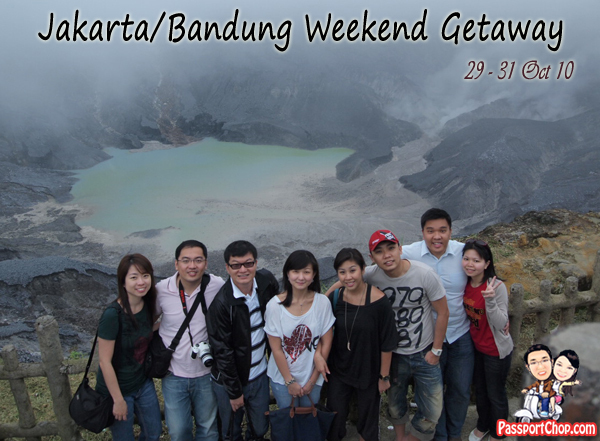 Over the next 2 weeks, we will be sharing with you our trip experiences in Jakarta and Bandung right here at PassportChop.com. For more info on Garuda Indonesia getaway packages, check out Garuda Indonesia Singapore site which offers a range of airfare+accommodation bundled packages to various Indonesian destinations – a 3D2N Garuda airfare packages to Jakarta with a stay at the very luxurious Hotel Indonesia Kempinski is selling now for only $608 – a very good deal! That was quick! We did have a good time and a pleasant experience. On the way to Adrian’s blog now…. Will have a long overlay in Changi in December, can’t wait to try the zippety zip JetQuay… is it free? It’s not free – cost from S$250 onwards for group of 3 depending on the services u r utilising – only if u r travelling Executive Class with Garuda Indonesia then you get to enjoy the service free. What a nice place and the concept of the resto there is absolutely great. I’ve heard good things about that. Thanks for sharing though. Nice review. Yes, Garuda has improved by leaps and bounds in the past few years. The JetQuay service looks good! Thanks for the great post! I will be flying from Singapore to Bali in October and am wondering which airlines should I book for this route. After reading your review, there is a high likelihood I will fly with Garuda Indonesia.